Drew Barrymore was born on February 22, 1975 at 11:51 AM PST in Culver City, California/USA (34 N 01 /118 W 24) (source: AstroDatabank, Rodden Rating AA). Not to overwhelm you with information, we will only assess the horoscope of Drew Barrymore by looking at the factors that only have some meaning for her love life. Over and over again, we notice that the mutable and double signs Gemini-Sagittarius on the Ascendant-Descendant axis of relationships bring numerous marriages and/or divorces. Indeed, in more than 70% of the cases, this seems to be true and here too, this rule works out beautifully. Drew Barrymore is currently married for the 3rd time after a couple of impulsive and short-lived marriages. This is not a failure or mishap at all! People with Gemini-Sagittarius on the Ascendant-Descendant axis just need more relationship experiences to evolve and develop themselves! Her predominant water element and the low fire count suggest a very sensitive nature. She may lack some confidence and may be(come) more dependent, which is often an indication of addictions and/or substance abuse. The powerful Sun-Uranus connection, analogy or affiliation represents nervous tension. This often reflects in sleepless nights. This connection often indicates going to extremes and/or be a rebel of some kind. It's a very creative connection and people with this connection need an outlet to live their creative visions from an early age. The powerful Uranus-Pluto connection is a divided or split one. It's a very freedom-loving and independent combo that reinforces the (compulsive-obsessive) need to be unconventional and free. It's the connection if the eternal and speedy changes. The MC and Venus at a 'critical' degree (29°) denote interest in spiritual topics (MC at 29° Aquarius) and the wrong expectations in matters of love (Venus at 29° Pisces). to Jeremy Thomas on March 20, 1994. The couple divorced on February 18, 1995.
to Tom Green on July 7, 2001. The couple divorced on October 15, 2002.
to Will Kopelman on June 2, 2012 in her Montecito, California/USA home. In a 45 minutes traditional Jewish ceremony that started around 06:30pm (18:30) in her backyard, heavily pregnant Drew Barrymore wed Will Kopelman. Let's take a look at her current marriage to Will Kopelman. Because we only know the ceremony took 45 minutes starting from 06:30pm, it's not clear when exactly the marriage was concluded, making for an uncertain Ascendant. 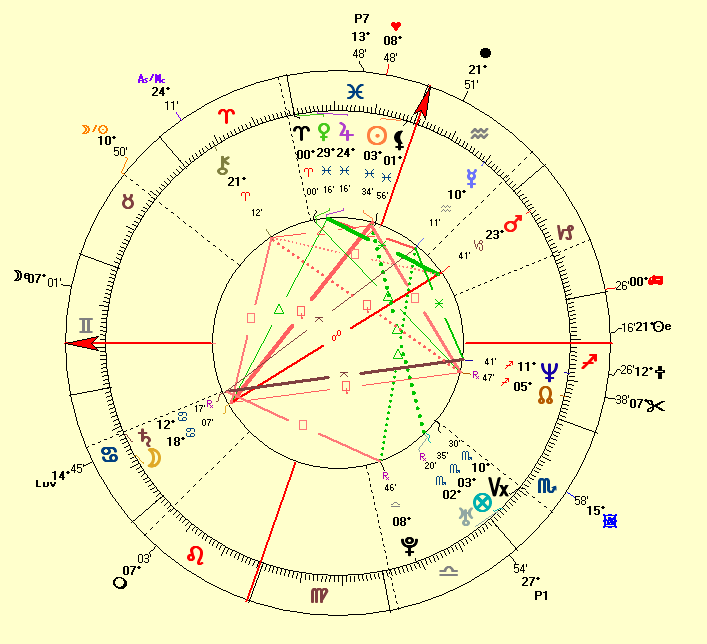 Please not that Drew Barrymore has this midpoint in her own natal chart as well. This may be an important one! 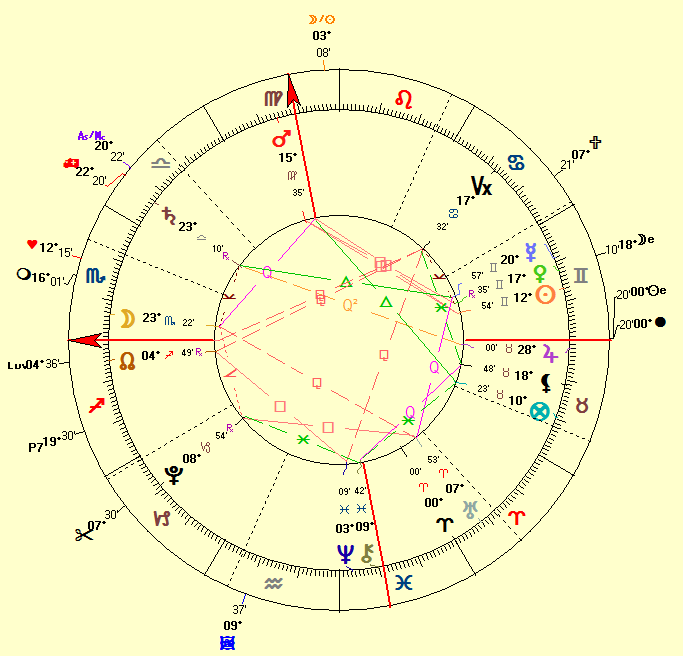 Mars is at a 'critical' degree (15° Virgo) signifying confusion and some issues to adapt properly. There can be allergies and infections in matters of health and substances that create 'poisonous' reactions. Retrograde Venus is in an applying square with Mars. Hmmm... This looks difficult because it suggests a lack of balance between giving and taking. This aspect reinforces some of the more difficult midpoints listed above. Update July 16, 2016: unsurprisingly, Drew Barrymore filed for divorce on July 15, 2016 from Will Kopelman. Update April 3, 2016: Drew Barrymore and Will Kopelman have confirmed through a statement released on April 2, they have separated after almost three years of marriage and add they are making their kids their top priority. The pair has two daughters Olive, 3, and Frankie, who will turn 2 later this month of April 2016. Rumors go "they seemed to not be very close or connected as a couple. Drew never spoke bad about her husband, they just seemed very disconnected." Clearly, if you take a look at her birth chart, you will understand that Drew is NO marriage material!